Many (though not all) of my stories start with a place I visit or see in pictures, which strikes me a particular way. In “God’s Country,” out in Nosetouch Press’ Asterisk Anthology Vol. 2, the story started with a swathe of farmland out behind the hotel I stayed in during the first weeks of training at company headquarters in southern Ontario, Canada. Unlike the land in my story, the real farm is functioning and fecund; last summer it grew rows of lovely dark green leaves that looked like spinach. When I first noticed it, however, it was in the dead of winter. The ground was as frozen and barren as it is in the story’s first scene, and standing on the corner of a four-way intersection between two towns, felt like the kind of in-between borderland that would attract a misfit teen. The other thing that interested me about that land was the clear demarcation between the mixed residential-industrial area nearby, and the farmland itself. I noticed this while looking at a map of the area, trying to plot out where different things were in relation to one another. It was as if the roadway had created an invisible barrier to development, and I began to question why that might be. Finally, the house with the skull painted on the side also existed at that time in Canada, though not in the place where I said it is. It was razed as part of what appears to be construction at the interchange of Routes 401 and 8, between Cambridge and Kitchener-Waterloo. I’m a little bit bummed about that, as it was a cool sight, but it lives on in the actual farmhouse that’s been turned into a visitors’ center. Sending a draft of the story to an old friend from my high school years, I worried that writing from the POV of a teenage girl put me squarely in the realm of “arrested development” — that it would be obvious that I might be parsing unresolved issues from that time in my life. Then I realized: that’s probably okay. More than okay, actually. What teen isn’t coming to grips with power they don’t always realize they have — the power to have real influence over others, whether to make them laugh or cry or run or vote? And what teen girl, specifically, hasn’t found herself at the mercy of adults who want to channel and direct that power for their own purposes? In fact, Mr. Gallagher is based on a couple of paternal mentor-types I’ve known throughout life; some harmless, and some not. His “summoning” of Maia reflects the tendency of those paternal types to view impressionable teens as extensions of themselves, and/or to impose their will on said teens. This was particularly poignant following the February 2018 shooting at Marjory Stoneman Douglas High School in Parkland, Florida. In an earlier version of the story, Maia stayed with Mr. Gallagher after learning the truth of her nature, so that he could train her. After the shooting, however, it seemed as if Maia’s passivity to Mr. Gallagher’s will just didn’t cut it anymore. She needed choice and agency in what he asked her to do. And it had to be tied into her earlier experiences living in this town. The evangelical-style church she attends (and escapes from) is an amalgam of Lutheran, Catholic, and Baptist influences I experienced as a youth. There, I heard a range of reactions to questions: Baptists’ unassailable logic, a Catholic who shut down a questioner with the classic “that’s just what the Bible said,” the Lutheran Sunday school teacher who made me feel like an outcast for drawing during his class, even though it helped me focus. More of Maia at some future point? “God’s Country” actually was a contest entry, a third-place winner. Because I’m always looking to improve my writing, I asked editor D.T. Neal what had kept it from being first-place. Apart from some blind spots to watch out for in future works, one thing he said stuck out at me: that there’s an opportunity to do more with Maia, flesh her out and show what it means to be an “elemental in a mundane world.” Whether the tentacled creature or its ancestor or progeny show up again — and in what dimension — remains to be seen, but the creative wheels are spinning. 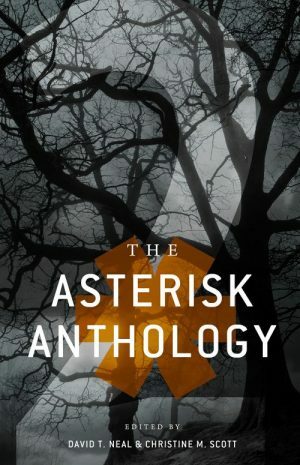 You can pick up a copy of the Asterisk Anthology Vol. 2 at the Nosetouch Press website!